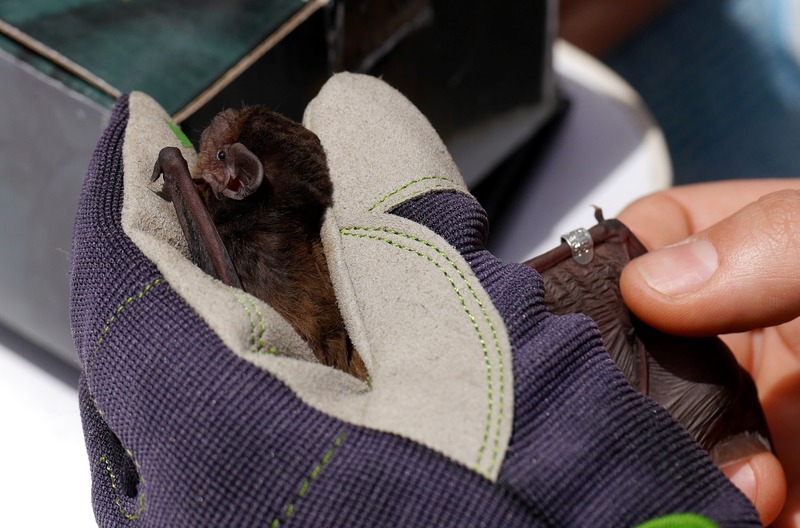 The Melbourne bat box monitoring program is run by a community of bat researchers and volunteers interested in the conservation of hollow-dependent microbats, and the education of the wider public about the ecology and values of these fascinating creatures. Wilson Reserve, Ivanhoe and Burke Road Billabong, in Kew East (map). Next check: Saturday 18th May, 12pm. Meet at the carpark at the end of Irvine rd. Organ Pipes National Park, in Keilor North (map). Next check: Sunday 28th April, 12pm. Meet at the boxes at the bottom of the big hill (walk down the paved road that leads from the carpark), or if you arrive a little later handlers may be in the visitor centre. New volunteers are always welcome – even if you just want to pop along to see a critter you’ve never seen before. Please visit our “What to expect” page prior to your visit. The program is run on an entirely voluntary basis by keen individuals in their own time. Although we are a cast of constantly changing characters, Robert Bender has been running the Organ Pipes National Park and Wilson Reserve monitoring programs for many years now, and can be contacted at redneb.trebor@gmail.com if you have any questions about these. The Burke Rd. Billabong nesting tubes and chainsaw cavities (http://brbreserve.org/) are overseen by Stanley Barker, contactable at barker_sv@yahoo.com.au. The key contacts for the monitoring at Gresswell Reserve and the La Trobe University Wildlife Sanctuary are Steve Griffiths S.Griffiths@latrobe.edu.au and Danielle Eastick D.Eastick@latrobe.edu.au. Dani manages our Facebook page which can be found here: https://www.facebook.com/Melbbatboxes/. Other individuals involved include Dr. Lindy Lumsden from the Arthur Rylah Institute and Dr. Pia Lentini, Dr. Lisa Godinho and Dr. Casey Visintin from the University of Melbourne. We are aided by the Friends of the Organ Pipes National Park, the Friends of Wilson Reserve, and the La Trobe Wildlife Sanctuary. We occasionally seek grants to hep fund the replacement and repair of the boxes, and the purchasing of processing and other scientific equipment. Hi, I’ll be in Melbourne February 18 – March 2. Are you planning any field trips I could join? Thank you. Are the bat boxes at Shepherd’s Bush Park yours? I saw a few bats emerging at sunset, but couldn’t identify them with any certainty; I wonder if you know what species they are. Hi again. Anything planned for December 10-22, by any chance? Yes! I’ve just updated the dates, next Organ Pipes check will be the 16th Dec. Thanks! Do we meet in the parking lot? Also, is it OK to bring my daughter (4 y. old)? She is used to fieldwork. P.S. I’m vaccinated and have bat handling experience. But my vaccination certificate might be difficult to dig up. I am pretty sure there’s more than one species there now. I got some photos of bats emerging at dusk, but they are poor quality because I didn’t want to use external flash. Hi, I’m curious if there are any programs on the southern Mornington Peninsula? I’d like to learn more, and I’d love to install some boxes around my house in Rye but am unsure if our trees are suitable (moonah, wattle, tea tree mainly). Thanks! Hi, just wondering if some of your boxes are PVC piping or if there has been any success with designs for PVC pipe bat roosts?